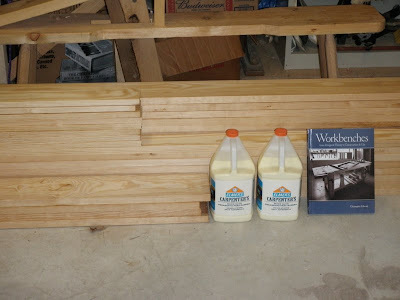 I'm building the Roubo-style workbench from Chris Schwarz's Workbenches. This is a great book, because it goes through in detail why the two included workbenches have the features they have, and how to accomplish various hand-tool operations on them. The book calls for 8/4 Southern Yellow Pine, or whatever dense species is cheap and plentiful in your area. What do you do when all you can find is 5/4 and 4/4 stock? Buy more glue! This stack is 290 linear feet of 4" and 6" width, $501.72 at The Woodery in Lunenburg, MA. The Roubo workbench is based on illustrations in Jacques-Andre Roubo's L'art du Menuisier (The Art of the Woodworker, 1769-1775). I love it's clean simple lines that belie enormous versatility. It's massive. That mass makes it a stable work platform. It won't move when you're planing or chopping a mortise. The top slab glued up and trimmed on one end. At 7'x24"x3.5", it probably weighs close to 200lbs. And it's low; that's my biggest leap of faith in following this design, since it will just come up to the base of my pinky. Roy Underhill describes a variation in his book The Woodwright's Guide. You can see it in this video. He describes the ideal height as just brushing your knuckles. 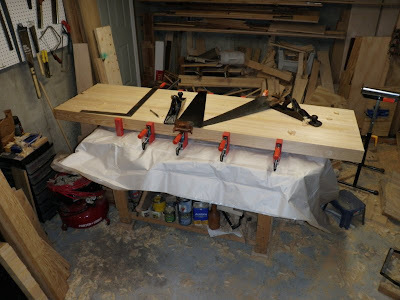 Unlike modern workbenches meant for power tools, these are low to allow you to get over a handplane. Chris describes this as the secret to longer endurance handplaning. Since I'm building this for hand-tool woodworking, I'm building it with hand tools. The only machines I'm using are my portable 10" planer to face all the stock, and my Shopsmith 4" jointer to joint the 6 top slab sections prior to final glue up. It's an ideal project for practicing and refining my skills. A minor mistakes here or there won't affect it's functionality; it's just sitting in my shop, not out for show. Trimming the other end of the top. Under it is the sad excuse for a home-made bench I've been using. Started life as the kids' bench from Woodworking for Kids. Fine for the kids to beat on, but not for handplaning, even with added MDF top. Racks like mad. You can also see why my new bench will not have a bottom shelf. Finishing off. The scrap end has already fallen off at a glue joint that failed due to planer snipe. 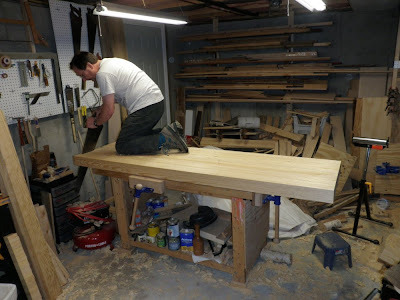 Hi Steve, what is the ideal thickness for a Roubo style bench? I am building mine out of soft maple and most of my boards are 6" wide. I was thinking of ripping those boards and then jointing them to their final dimension (5") just before I glue them up. I need as much weight as I can get from my boards since I only have space for a small bench (5' 4") The top will measure around 18-20" in width. I will decide on that later. Now to decide on the height of the bench. Mine is 3" thick, 6'9" long, 22" wide. Schwarz shows 4" thick top in his book, and the Lie-Nielsen Roubo is also 4". I would probably stick with that as a good thickness. Even if it's just 18" wide, the top will have plenty of weight. If you are able to make the legs and stretchers the full dimension Schwarz recommends, that will also contribute to the weight. However, I do note that when Schwarz later built a Roubo out of solid cherry slabs, the top pieces were 5" thick rough. I'm not sure what they ended up being, although I can't imagine he took much thickness out of them. You might check on some of his blogs and see if he lists the final thickness anywhere. I've actually raised my bench up some more on riser feet so that the top is at my wrist joint. That's to reduce back strain. 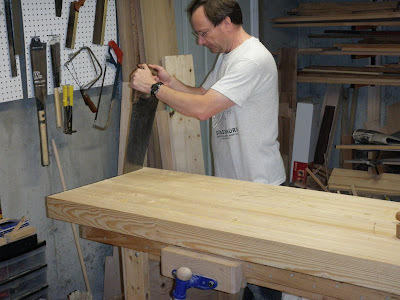 A low bench helps keep from wearing out your arms with lots of planing, but as a hobbyist, I'm not planing for hours on end. So easing my back wins out over wearing my arms out. Hi Steve, Yes, I will have to check Chris's blog to find out the final thickness of that cherry bench. 5' might be excessive but then they say you can't overbuild a Roubo. I don't want the height of my bench too low because like you I don't want to run into any back problems! The mobile outfeed table I have now is too high for planing. It was never intended to be used for planing but since I have gotten into handtools I find myself in desperate need of a handtool bench. After working on this mobile table I know what you mean by tired arms. I am planning on building the base assembly as big as possible. Pretty sure I can find some 8/4 maple for the 5"X 5" legs and the stretchers. Just one more ? Did you run into any problems when it came time to mill the faces of your boards? I'm using a power jointer to joint mine rather than handplanes. My 8/4 lumber is in the rough. I ran into some twist and cup on one board the other day. Ripping it first on the band saw before running it over the jointer removed some of the twist and cup. Do you have any tips on how to make that board flat? If I'm not mistaken I have to put all my downward pressure on the parts of the board that are touching the table. ( I have the bark side up) until I can no longer see any light benath the board. That could take a few passes over the power jointer. I milled all my lumber with a benchtop power planer, and fortunately didn't have any twisted stock to deal with. To remove twist with a hand plane, plane diagonally from one high point to the other, which I've done for other projects. I haven't ever done that on a jointer, so I can't offer any advice on doing that, but the method you describe sounds like the power equivalent of planing across the high points, as long as you're careful to keep the pressure on the right points. If you use a hand plane to do it, I would expect that you can get it to the point where you have a reasonably flat side to run over the jointer. Have you ever encountered snipe? I would hate to have to cut the ends of my boards to remove snipe. I tested out he planer the other day and there was just a wee bit of snipe on the end of the board. It was very slight. To prevent snipe I was thinking of passing a test board (same thickenss as my good stock) through the planer first then passing all my boards through.. and again passing the test piece through as the last board passes through the planer. I think that will take care of any snipe. Less work than adjusting the outfeed and infeed tables. one last ? for you.. when it comes to the glue up how many clamps are necessary? I've had no problem gluing edges but I don't have much experience gluing up faces. I was thinking of using cauls to distribute the pressure more evenly. I'm only going to glue up 2 boards at a time. And once I have all the boards glued up into sections(section=2 boards) I will begin gluing up sections. The glue I have doesn't allow much open time so I will have to work fast. Did you use a yellow glue or white glue? I was going to use Lepage's glue but I might go with something else. Is there any difference between Elmer's white glue, Titebond 2 and Lepage's yellow glue? I'm probably better off using a glue that dries transparent. Yeah, snipe is a real pain. I'm not sure passing a test board will help out. What I'm used to is the snipe happening as the end of the board passes over the feed roller. You can do the bulk of your planing with the power planer, then the last little bit by hand to plane out the snipe. Clamps: as many as you can get! It's nice to have a clamp every 6-12 inches. With face glue-ups there's a lot of surface that needs to be in contact, so you need to spread lots of pressure around. I used Elmer's yellow carpenter's glue. I don't know for sure, but I suspect any of them would do well. I used to use Elmer's white glue many years ago, and it did fine, although I wasn't doing anything as large as this. But they should all be plenty strong. Thanks for getting back to me. I went ahead and ordered 3 24" bessey clamps from LV. They should arrive sometime this week. In the meantime I will begin planning tomorrow. I have my fingers crossed that the snipe won't be too difficult to deal with.